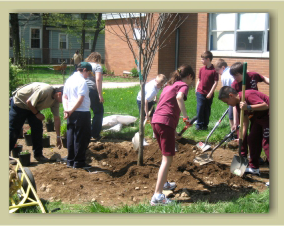 DERBY, CT – 2011 – In honor of Arbor Day, Northeast Horticultural Services planted an Eastern redbud tree (which is a native flowering tree Cercis canadensis) and installed a small meadow planting in front of St. Mary and St. Michael School in Derby. Not only did this beautify the grounds of the school, but it was intended to be an educational opportunity for the students. Stacey Marcell, owner of Northeast Horticultural Services, and her team, demonstrated to the students the proper way to plant and care for a tree. The presentation covered all the benefits trees provide to humans, animals and the earth and why trees are so important to our ecosystem. “We want to teach the children about biodiversity, sustainability and how to be good stewards of the earth. Meadows are great alternatives to lawns. Lawn requires chemical inputs, and we want to teach children that pesticides are not good for the earth,” says Stacey. This tree is part of a new meadow planted from native plants, that once established will be self sustaining and will not need chemical inputs to maintain it. The meadow planting can then also be used as an educational tool going forward. The children will be able to watch the meadow grow and change, observe the activity of the birds, butterflies and insects. The teachers can utilize this meadow as an asset in the science-related curriculum.